Do you remember the mysterious cylindrical shaped object from interstellar space named Oumuamua that came within our solar system last month? 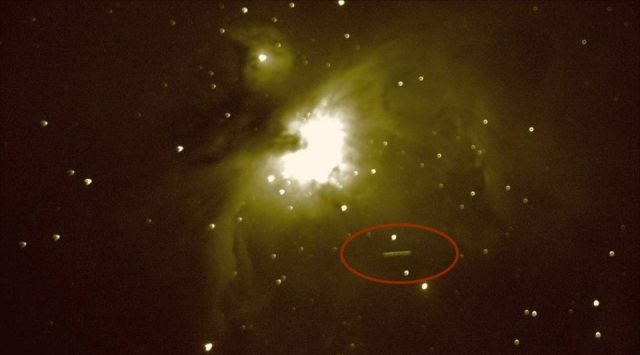 Now, on November 29, 2017 a sky-watcher from North Carolina was out collecting data on M42 Orion Nebula. 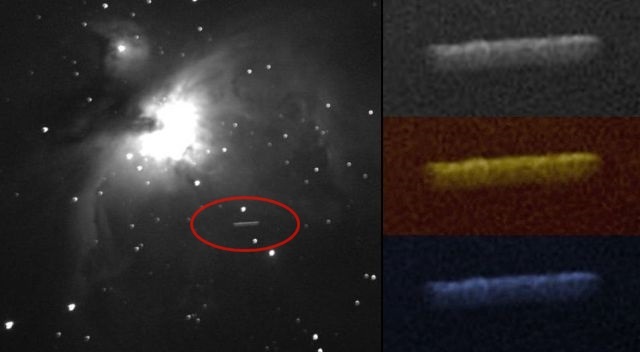 As he still was fine focusing his 8 in astrograph / Newtonian Telescope a giant cylinder shaped UFO appeared on his laptop screen which he captured in a single 30.2 second frame. Just as he thought the thrill was over several other objects appeared on the laptop screen which he also captured in a 5 frame sequence at 30.2 second frames and it clearly shows the movement of the objects at the bottom of the frames. GIF image: See the movement of the objects at the bottom of the frames. how on earth any government can say their are no such thinks as ALIENS need to look at some of these video's.